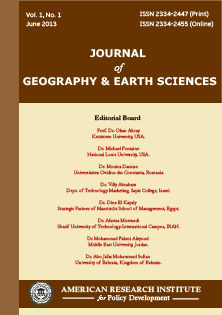 Journal of Geography and Earth Sciences is an international natural science journal that seeks to publish articles related to physical process and spatial patterns at the earth's surface, physio-geographical elements and their interaction, global change and its regional response, characters and management of natural resources, landscape ecology and environmental construction, remote sensing, geographic information system and their applications in geographical research. The journal strives to strengthen connections between research and practice, so enhancing professional development and improving practice within the field of geography and earth sciences. The journal follows double-blind peer review process. Each paper published in Journal of Geography and Earth Sciences is assigned a DOI®number, which appears beneath the author's affiliation in the published paper. Click HERE to know what is DOI (Digital Object Identifier)? Click HERE to retrieve Digital Object Identifiers (DOIs) for journal articles, books, and chapters. Dr. Justin Saldana, University of La Verne, USA. Michael O. Akintayo (Ph.D), Metropolitan College, New York, USA. Dr. Shufan Liu, University of South Carolina, USA. Dr. S. Arulchelvan, Anna University, USA. Prof. Tryfon KORONTZIS, Hellenic National School of Local Government, Greece. Dr. Dacosta Aboagye, Kwame Nkrumah University of Science and Technology, Ghana. Dr. Eja Iwara Eja, Dept. of Geography and Environmental Science, University of Calabar, Nigeria. Professor OLAWEPO, Raphael Abiodun, University of Ilorin, Nigeria. Mrs. Rizki wannahari, Universiti Malaysia Kelantan, Malaysia. Mr. Daniel Kipkorir, Dept. of Anthropology and Human Ecology, Moi University, Kenya. Dr. Jamal Al-Khaldi, Al-Zaytounah University, Jordan. Dr. Gloria Gempes, University of Mindanao, Philippines. Dr. Atubi, Augustus Orowigho, Delta State University, Abraka, Nigeria.